← Sermon: A test Abraham failed? On the 7th of July I was one of the tens of thousands of Australians who took part in the #BustTheBudget, #OurCommunityCounts March for a Fairer Australia. 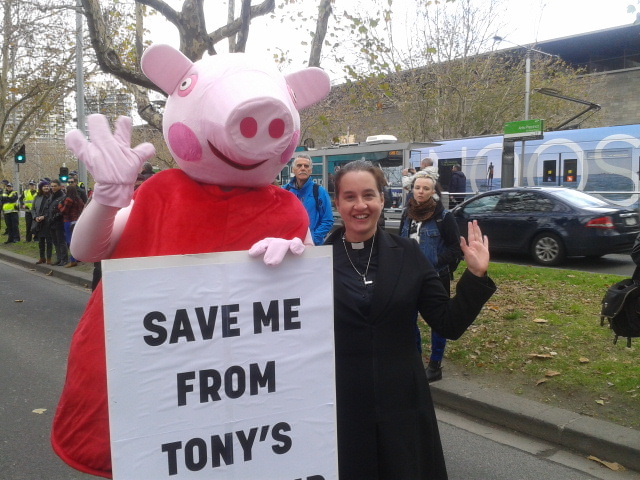 I was honoured to be invited to speak to the rally as an “ordinary minister” of the Uniting Church, concerned about what the 2014 Budget will do to already vulnerable people. This is what I said. (More or less – I spoke without my notes.) Every week members of the Williamstown Uniting Church bring offerings of non-perishable food. Every week we bless the food, and pray for those who will receive it. Then it goes to an emergency relief program housed in another Uniting Church, managed by Anglicare, and staffed by volunteers from many different churches and from the community. And every week I’m torn. Christians love feeding the hungry; it’s one of the things that Jesus told us specifically to do. I’m proud of my people when they bring food and give it to those who need it. But I wonder why, in a rich country like Australia, there are people who would go hungry without charity. Why isn’t Australia’s wealth shared more equally? Loving our neighbour is central to Christianity. When a lawyer tried to catch Jesus out by asking “who is my neighbour?” Jesus answered with the story of two deadly enemies: a Jew and a Samaritan. You might have heard of it. Here in Australia today our neighbours are the single parents going without food to pay for their kid’s school excursions. Our neighbours are the workers in their fifties suddenly unemployed because their factory has shut down, told they’re too old to get another job. Our neighbours are the First Australians (who incidentally were here long before Australia was ‘settled’!) dying so much sooner than the rest of us. Our neighbours are the people living with disabilities who need some support to live a full life. Our neighbours are the asylum seekers living in the community on bridging visas without the right to work or any government support.Our neighbours are the people who come into the Emergency Relief Program looking for the help that we’re told Australia can’t afford to give them. There are some very prominent Australians who declare themselves to be Christian. I want to say to them; for God’s sake, practice what you preach! Remember, Jesus said absolutely nothing about homosexuality, but he said an awful lot about feeding the hungry and welcoming the stranger and caring for the sick. And for the rest of us, people of goodwill of any faith or no faith, let’s commit ourselves to making this a country we can be proud of. This entry was posted in Political Activism, Random Musings. Bookmark the permalink.